Despite the high incidence, associated morbidity, and effects on patient quality of life and economic consequences, no standard RT technique is approved for the prevention of mucositis in HNC. The radiation oncology community has concentrated on studies designed to determine whether altering fractionation schedules can improve cancer control, such as hyperfractionation and concomitant boost fractionation for HNC. However, the incidence of grade 3 or 4 acute mucositis increased by 16%–22% in patients treated with accelerated fractionation or hyperfractionation compared with the conventional schedule. It has been shown that oral mucositis is correlated with doses received by the oral cavity (e.g., 15, 30, 40, 45, and 50 Gy).,,, Cumulative doses to the oral cavity of 32 Gy were associated with acute mucositis, and a dose >39 Gy was associated with longer duration of mucositis. In an attempt to minimize radiation-induced mucositis, Sanguineti et al. suggested delivering the smallest possible dose to the oral cavity. In this research, we provide a treatment plan, that is, promising for reduction of the risk of oral mucositis in locally advanced HNC compared to clinical treatment plans generated using conventional IMRT and VMAT. In this retrospective, institutional review board-approved study, we collected data from 10 patients with locally advanced HNC who had undergone RT in our clinic. Treatment targets included the primary tumor and cervical nodes. 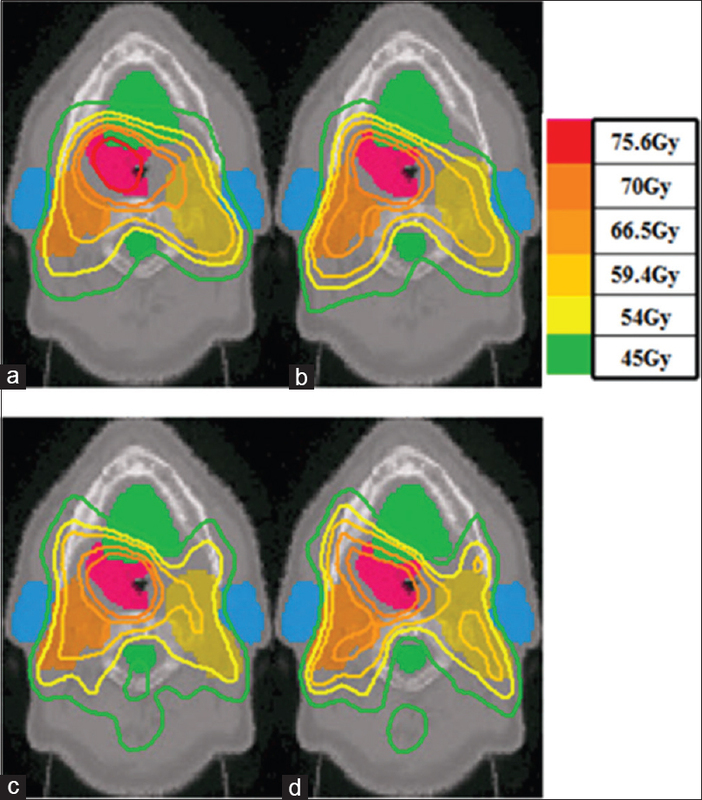 A simultaneous integrated boost was employed as the mode of delivery, and the prescribed doses to the primary tumor and high-and low-risk (LR) nodes were 70, 59.4, and 54 Gy, respectively, in 35 fractions. Organs-at-risk (OARs) included the parotid glands, oral mucosa surrounding the oral cavity, brain stem, and spinal cord. We used previously published dose–volume constraints in the optimization process [Table 1]. Two types of IMRT plans were generated for each patient. The first was generated using the Pinnacle 3 planning system (Philips Healthcare; Fitchburg, WI, USA). The second was generated using our linear programming (LP)-based approach. Although IMRT plans were also generated using the Eclipse planning system (Varian Medical Systems; Palo Alto, CA, USA), both planning systems resulted in comparable IMRT plans. We describe the planning specifics and results for only the Pinnacle 3 planning system in this report. In this work, nine beams were used in IMRT treatment planning. Selected angles were input to the commercial IMRT planning systems. The Pinnacle 3 planning system used a gradient-based optimization approach for conventional IMRT. These plans will be referred to as Pinn IMRT plans. where i is an index corresponding to beam apertures and j is an index corresponding to voxels over which constraints are specified. The LP dose optimization objective involves minimizing the weighted sum of doses delivered to the voxels that violate the thresholds for dose–volume histogram (DVH) constraints. The treatment volume is divided into region O, including OARs; region T, including the planning target volumes; and region N, which corresponds to normal tissue voxels. In this work, normal tissue is defined as nontarget and non-OAR tissue. Input data include beam aperture-specific dose matrices B corresponding to each delivery aperture. DVH constraints are handled through the introduction of penalty variables that account for target, OAR, and normal tissue underdose and overdose as relevant. 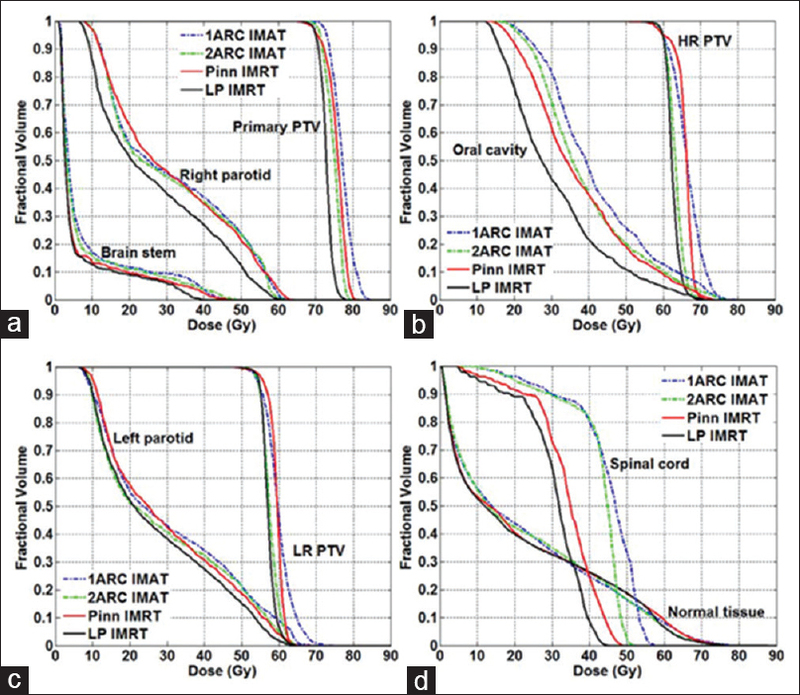 bTARL ,bTARU , bOAR ,bNOR and bSPC specify the desired dose thresholds for the target, OAR, normal tissue, and any designated region, respectively, at which constraints are desired. xj, j ∈ T, is a vector of underdoses/overdoses (doses below the prescription level or above a certain level [hot spot] for target voxels) delivered to the target region. The variable xj, j ∈ O and j ∈ N is a vector of overdoses (doses over a certain critical level) delivered to the OARs and normal tissue. S is a subset of O, which corresponds to a special region, such as the spinal cord voxels, in which hard upper-bound dose constraints instead of DVH constraints are specified. wi is the weight (to be optimized) for aperture i of beam angle set θ. αTARL ,αTARU ,αOAR, and αOAR are the penalty weights assigned for underdosing, overdosing the target, and overdosing the OARs and normal tissues, respectively. Each type of constraint can be enforced on multiple targets and OARs. Multiple constraints can be enforced on each target and OAR as well. The dose optimization problem was formulated in the General Algebraic Modeling System (GAMS Development Corporation; Washington, DC, USA); a high-level modeling system for mathematical programming and optimization. The linear program was then solved with an integrated high-performance commercial solver, Parallel CPLEX (IBM; Armonk, NY, USA) on a cluster of 48 Intel 2.4 GHz CPUs available at our clinic. Single-arc and double-arc VMAT plans were generated using the Pinnacle 3 planning system. The Pinnacle 3 planning system adopts a multistep optimization algorithm developed by Bzdusek et al. which includes initial segments generation, arc sequencing, machine parameter optimization, and segment weight optimization steps. For each arc, 180 apertures (control points) were used, resulting in 180 apertures for the single-arc (referred to as 1ARC) plans and 360 apertures for the double-arc (referred to as 2ARC) plans. This setting per arc corresponds to the maximum number of apertures available for VMAT from Pinnacle 3. A summary of the treatment plans generated and their differences are shown in [Table 2]. We retrospectively tested our approach on data from 10 patients with locally advanced HNC who had undergone conventional RT in our clinic. To compare different treatment plans, we let each approach improve the OAR and normal tissue sparing as much as possible by adjusting weights associated with the individual dose and dose–volume constraints. The adjustments were guided using the best plan obtained from a competing technique as an improvement goal. Each plan was allowed up to 2 h of planning time for improvement. where Sl is the actual rotation speed at control point l.
Qualitative dosimetric results are shown as DVH plots [Figure 1] and isodose curves [Figure 2]. 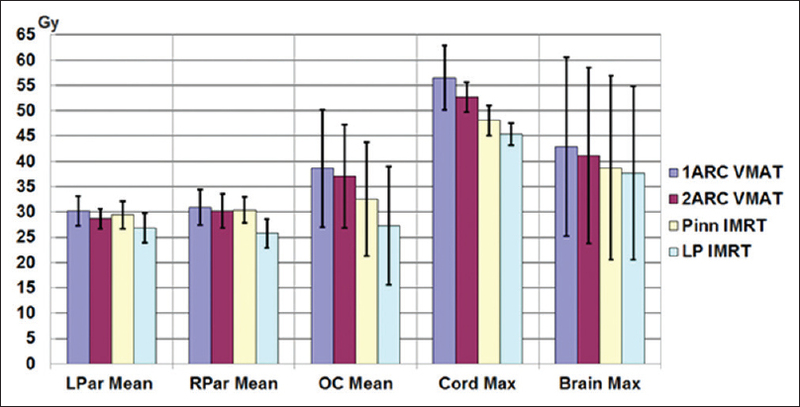 Quantitative results were collected at OAR dose constraint setting levels as shown in [Figure 3]. [Figure 1] shows the mean DVHs of the 10 patient records considered in this research. Four approaches were compared, with solid lines representing the two IMRT approaches and dashed lines representing the two VMAT approaches. Primary planning treatment volume, high-risk PTV, and LR PTV DVHs in [Figure 1] show that all plans achieved essentially the same target coverage. LP IMRT achieved the best dose uniformity, and 1ARC VMAT resulted in the worst. Pinn IMRT and 2ARC VMAT had similar dose uniformity. The maximum difference between PTV DVHs was <10%. In comparing OAR sparing across different treatment plans, [Figure 1]a shows that all four plans achieved similar brainstem sparing. Pinn IMRT and both VMAT plans resulted in the same sparing of the right parotid. LP IMRT spared 15% more of the right parotid than the other three approaches. From oral cavity DVHs shown in [Figure 1]b, the LP IMRT plan was superior for preserving oral cavity; 20% better than the Pinn IMRT and 2ARC VMAT plans, which were 10% better than the 1ARC VMAT plan. Left parotid sparing was essentially the same (difference <10%) for all four plans, as shown in [Figure 1]c. For spinal sparing, the 2ARC VMAT plan delivered 10% less maximum dose to spinal cord than the 1ARC VMAT plan [Figure 1]d. LP IMRT delivered 6% and 12% less maximum doses to spinal cord than the Pinn IMRT and 2ARC VMAT plans, respectively. Looking at more detailed quantitative results (absolute dose in Gy received by each OAR at constraint setting levels, [Figure 3]), the LP IMRT plan resulted in 2–5 Gy (6%–17%) lower mean doses for both parotids than the other three plans. For oral cavity mean doses, the LP IMRT plan was 5–11 Gy (16%–29%) lower than the other plans. The maximum spinal cord dose of the LP IMRT plan was 3–11 Gy lower than the other plans. [Figure 2] shows the isodose curves on an axial slice of one of the cases as an example of dose distribution comparison. Only the 1ARC VMAT plans showed hot spots in the primary PTV. The difference in target coverage in isodose curves between the IMRT plans and 2ARC VMAT plan was negligible. LP IMRT plans displayed better OAR sparing for parotids, oral cavity, and spinal cord than the other plans. From the last two columns of [Table 3], we observe that the average CI and DGI achieved by the Pinn IMRT and 2ARC VMAT plans were similar. The LP IMRT plan resulted in the lowest average CI and DGI, whereas the 1ARC VMAT plan resulted in the highest. Paired t-tests were conducted to determine whether differences achieved at OAR dose constraint setting levels between different plans were statistically significant [Table 4]. We can see that except for brain stem sparing, the differences between LP IMRT and the other three plans were significant. The tests confirmed the superior preservation of oral cavity and parotid glands achieved by LP IMRT. The mean and standard deviation of total MUs, number of apertures, and treatment delivery time for all plans are summarized in [Table 3]. The 2ARC plans resulted in 20% more MUs than 1ARC plans. LP IMRT plans resulted in 10% more MUs than Pinn IMRT plans. IMRT plans at least doubled the MUs used by VMAT plans. The number of apertures in the IMRT plans was generally between that of the 1ARC VMAT and 2ARC VMAT plans, which were ~180 and ~360, respectively. LP IMRT plans reduced the number of apertures by 25% compared with Pinn IMRT plans. LP IMRT plans resulted in zero weights for a significant number of the Pinn IMRT apertures while improving plan quality. This finding ultimately resulted in 8% shorter calculated LP IMRT delivery times than Pinn IMRT delivery times. 2ARC VMAT delivery times were ~2.5 min shorter than the estimated LP IMRT delivery times. Our results showed that double-arc VMAT plans improved plan quality over single-arc VMAT plans. IMRT plans and double-arc VMAT plans generated by Pinnacle 3 were comparable. However, our LP-based IMRT consistently provided better overall plan quality than both the IMRT and double-arc VMAT plans. The CI and DGI of LP IMRT plans were consistently better than those with other plans. DVHs for normal tissues were better for LP IMRT plans than for VMAT plans. For locally advanced HNC cases, OARs either sit within the concavity of the targets or are very close to the targets. Mallick and Waldron  showed that the rate of oral mucositis is quite high in patients being treated with fields involving the oral cavity. Since VMAT treatment plans deliver radiation through all possible beams around the patient, it is difficult to avoid those fields involving the oral cavity. As our results showed, VMAT plans were not as competitive as IMRT delivery techniques for preserving the oral cavity. It has been shown that most patients who receive >50 Gy to the oral mucosa will develop severe ulcerative oral mucositis. Clinical severity is directly proportional to the radiation dose administered. Shogan et al. showed a correlation between oral cavity dose and mucositis when using IMRT. A statistically significant correlation between acute mucositis grade and percentage of volume of oral cavity receiving 15, 30, 40, and 45 Gy was identified. In other studies, a correlation between grade 3+ mucositis and oral cavity doses of 9.5 and 10.1 Gy per week was found., Cumulative doses of 32 Gy to the oral cavity were associated with acute mucositis, and a dose >39 Gy was associated with longer duration of mucositis. Delivery of the smallest dose possible to the oral cavity has been suggested to avoid radiation-induced mucositis. As the results show in this work, using any of these dose levels as an evaluation criteria, our LP IMRT approach is the most promising to prevent radiation-induced mucositis. Clinical comparisons of IMRT and VMAT treatment plans for HNC have reported either similar or better results with VMAT than IMRT.,,, Some of these reports did not include oral cavity sparing as the main comparative objective., The limitation in the respective IMRT plans was that fewer beams and apertures utilized (e.g., 39 apertures over 5–7 beams by Bertelsen et al.) may constrain performance in these plans. Most of the comparisons did not report the number of apertures used. Moreover, to deliver radiation continuously as the gantry rotates around the patient, VMAT requires that successive beam apertures be linked. The link between successive apertures is primarily dictated by the physical speed of the multileaf collimator leaves. As a result, the selection of beam apertures in VMAT is constrained by the need to link apertures to their neighbors. This constraint may adversely influence plan quality, which may be the reason that VMAT could not spare the oral cavity better than IMRT plans in this study. On the other hand, the superior results achieved by our LP IMRT approach were contributed from both accurate dose calculations and exact optimization algorithm. Most commercial planning systems tend to employ fast, but somewhat inaccurate dose calculation algorithms that provide input to the optimization algorithm. The achieved optimal solution differs from the dose distribution obtained when one performs a more accurate dose calculation. Al-Hallaq et al. demonstrated that more accurate dose calculation algorithms, such as convolution/superposition or Monte Carlo approaches, are better suited for IMRT in tailoring doses in HNC cases. The dose calculation algorithm utilized in this research is Monte Carlo kernel superposition. The other factor that may influence results is the optimization approach employed, as suggested by Bortfeld and Webb. Most commercial planning systems employ heuristic or local search-based optimization approaches. Exact optimization approaches such as LP guarantee optimal solutions and provide explicit handling of constraints (soft and hard) over target and OAR voxels. Other exact optimization approaches, such as quadratic programming, should also provide similar results. On another note, IMRT and VMAT explore the degrees of freedom in generating conformal plans differently (aperture space vs. angular space, respectively). Our results show that for reducing the risk of oral mucositis in locally advanced HNC, LP IMRT becomes a more promising approach than VMAT. This result is observed despite the decrease in the number of beam apertures employed in the IMRT plans compared with 2ARC VMAT plans. Our work further suggests that when one considers comparisons between IMRT and VMAT using commercial software, on average, it is possible to obtain comparable plans. However, the LP IMRT approach produces substantially improved results. For locally advanced HNC, many structures in addition to the oral cavity are at risk for complications. We included these as nontarget/non-OAR normal tissues in this research because of concerns about reducing the risk of secondary cancer and complications for those structures. Hall  and Suit et al. have pointed out that consideration in any radiation technique is the potential for increasing the number of radiation-induced secondary cancers. They noted that the volume of normal tissue exposed to leakage or low doses is directly related to secondary cancers. Guckenberger et al. have shown that using multiple arcs increases the spread of low doses to normal tissue. Our results for normal tissue doses are consistent with this finding. In this work, normal tissue dose was explicitly considered in the constraints. This led to the finding that LP-based fixed-field IMRT plans resulted in lower normal tissue doses compared with VMAT plans for all 10 test cases considered. Our approach is analogous to segment weight optimization, which has been widely used in clinical practice. The limitation of our approach in the current form is that the starting point of the second phase is based on apertures generated from conventional IMRT plans. The quality of our approach could be further improved if a larger pool of high-quality apertures could be considered. This is the goal of next steps in our research. The entire framework as described here can be easily implemented and adapted to practical clinic use. In addition to clinical evaluations of commercially available planning software, we applied a different optimization approach for fixed-field IMRT: LP-based IMRT. Our results showed that LP-based fixed-field IMRT plans resulted in superior dosimetric quality compared with conventional IMRT and VMAT plans. VMAT plans, however, consistently resulted in the lowest treatment delivery times. LP-based IMRT was the most promising treatment plan, for patients with locally advanced HNC, that preserves oral cavity and parotid glands so that the risk of oral mucositis can be reduced. This work was financially supported in part by a grant NIH/NCI CA130814. Stewart BW, Wild CP. World Cancer Report 2014. International Agency for Research on Cancer; 2014. Franzese C, Fogliata A, Clerici E, Franceschini D, Villa E, D'Agostino G, et al. Toxicity profile and early clinical outcome for advanced head and neck cancer patients treated with simultaneous integrated boost and volumetric modulated arc therapy. Radiat Oncol 2015;10:224. Van Gestel D, Van Den Weyngaert D, Schrijvers D, Weyler J, Vermorken JB. Intensity-modulated radiotherapy in patients with head and neck cancer: A European single-centre experience. Br J Radiol 2011;84:367-74. Vera-Llonch M, Oster G, Hagiwara M, Sonis S. Oral mucositis in patients undergoing radiation treatment for head and neck carcinoma. Cancer 2006;106:329-36. Elting LS, Cooksley CD, Chambers MS, Garden AS. Risk, outcomes, and costs of radiation-induced oral mucositis among patients with head-and-neck malignancies. Int J Radiat Oncol Biol Phys 2007;68:1110-20. Duncan GG, Epstein JB, Tu D, El Sayed S, Bezjak A, Ottaway J, et al. Quality of life, mucositis, and xerostomia from radiotherapy for head and neck cancers: A report from the NCIC CTG HN2 randomized trial of an antimicrobial lozenge to prevent mucositis. Head Neck 2005;27:421-8. Lalla RV, Peterson DE. Oral mucositis. Dent Clin North Am 2005;49:167-84, ix. Treister N, Sonis S. Mucositis: Biology and management. Curr Opin Otolaryngol Head Neck Surg 2007;15:123-9. Lalla RV, Sonis ST, Peterson DE. Management of oral mucositis in patients who have cancer. Dent Clin North Am 2008;52:61-77, viii. Murphy BA. Clinical and economic consequences of mucositis induced by chemotherapy and/or radiation therapy. J Support Oncol 2007;5:13-21. Elting LS, Cooksley C, Garden AS. Clinical Outcomes of Radiotherapy-Induced Oral Mucositis among Patients with Head and Neck Cancers. Abstract #15-096. Proceedings from the 17th MASCC/ISOO International Symposium. Geneva, Switzerland; June 30-July 2, 2005. Peterman A, Cella D, Glandon G, Dobrez D, Yount S. Mucositis in head and neck cancer: Economic and quality-of-life outcomes. J Natl Cancer Inst Monogr 2001;29:45-51. Rosenthal DI. Consequences of mucositis-induced treatment breaks and dose reductions on head and neck cancer treatment outcomes. J Support Oncol 2007;5:23-31. Fu KK, Pajak TF, Trotti A, Jones CU, Spencer SA, Phillips TL, et al. A radiation therapy oncology group (RTOG) phase III randomized study to compare hyperfractionation and two variants of accelerated fractionation to standard fractionation radiotherapy for head and neck squamous cell carcinomas:First report of RTOG 9003. Int J Radiat Oncol Biol Phys 2000;48:7-16. Garden AS. Mucositis: Current management and investigations. Semin Radiat Oncol 2003;13:267-73. Epstein JB, Gorsky M, Guglietta A, Le N, Sonis ST. The correlation between epidermal growth factor levels in saliva and the severity of oral mucositis during oropharyngeal radiation therapy. Cancer 2000;89:2258-65. Shogan JE, Bhatnagar A, Heron DE, Smith RP, Andrede RS, Huq MS, et al. Dosimetric correlation of oral cavity dose with acute mucositis in patients treated with intensity modulated radiation therapy (IMRT) and chemotherapy. Int J Radiat Oncol Biol Phys 2005;63:S73-4. Sanguineti G, Gunn GB, Parker BC, Endres EJ, Zeng J, Fiorino C, et al. Weekly dose-volume parameters of mucosa and constrictor muscles predict the use of percutaneous endoscopic gastrostomy during exclusive intensity-modulated radiotherapy for oropharyngeal cancer. Int J Radiat Oncol Biol Phys 2011;79:52-9. Sanguineti G, Sormani MP, Marur S, Gunn GB, Rao N, Cianchetti M, et al. Effect of radiotherapy and chemotherapy on the risk of mucositis during intensity-modulated radiation therapy for oropharyngeal cancer. Int J Radiat Oncol Biol Phys 2012;83:235-42. Narayan S, Lehmann J, Coleman MA, Vaughan A, Yang CC, Enepekides D, et al. Prospective evaluation to establish a dose response for clinical oral mucositis in patients undergoing head-and-neck conformal radiotherapy. Int J Radiat Oncol Biol Phys 2008;72:756-62. Sanguineti G, Sosa M, Culp L, Endres E, Bayouth J. Is it feasible to spare part of the mucosa with IMRT and does it matter. Int J Radiat Oncol Biol Phys 2004;60:S517-8. Lee N, Mechalakos J, Puri DR, Hunt M. Choosing an intensity-modulated radiation therapy technique in the treatment of head-and-neck cancer. Int J Radiat Oncol Biol Phys 2007;68:1299-309. Zhang HH, Meyer RR, Wu J, Naqvi SA, Shi L, D'Souza WD, et al. A two-stage sequential linear programming approach to IMRT dose optimization. Phys Med Biol 2010;55:883-902. GAMS. Available from: http://www.gams.com. [Last accessed on 2018 Jan 02]. Bzdusek K, Friberger H, Eriksson K, Hårdemark B, Robinson D, Kaus M, et al. Development and evaluation of an efficient approach to volumetric arc therapy planning. Med Phys 2009;36:2328-39. Rao M, Yang W, Chen F, Sheng K, Ye J, Mehta V, et al. Comparison of Elekta VMAT with helical tomotherapy and fixed field IMRT: Plan quality, delivery efficiency and accuracy. Med Phys 2010;37:1350-9. Naqvi SA, Earl MA, Shepard DM. Convolution/superposition using the Monte Carlo method. Phys Med Biol 2003;48:2101-21. Mallick I, Waldron JN. Radiation therapy for head and neck cancers. Semin Oncol Nurs 2009;25:193-202. Bertelsen A, Hansen CR, Johansen J, Brink C. Single arc volumetric modulated arc therapy of head and neck cancer. Radiother Oncol 2010;95:142-8. Doornaert P, Verbakel WF, Bieker M, Slotman BJ, Senan S. RapidArc planning and delivery in patients with locally advanced head-and-neck cancer undergoing chemoradiotherapy. Int J Radiat Oncol Biol Phys 2011;79:429-35. Al-Hallaq HA, Reft CS, Roeske JC. The dosimetric effects of tissue heterogeneities in intensity-modulated radiation therapy (IMRT) of the head and neck. Phys Med Biol 2006;51:1145-56. Bortfeld T, Webb S. Single-arc IMRT? Phys Med Biol 2009;54:N9-20. Hall EJ. Intensity-modulated radiation therapy, protons, and the risk of second cancers. Int J Radiat Oncol Biol Phys 2006;65:1-7. Suit H, Goldberg S, Niemierko A, Ancukiewicz M, Hall E, Goitein M, et al. Secondary carcinogenesis in patients treated with radiation: A review of data on radiation-induced cancers in human, non-human primate, canine and rodent subjects. Radiat Res 2007;167:12-42. Guckenberger M, Richter A, Krieger T, Wilbert J, Baier K, Flentje M, et al. Is a single arc sufficient in volumetric-modulated arc therapy (VMAT) for complex-shaped target volumes? Radiother Oncol 2009;93:259-65.